Were you recently using Google Chrome web browser for Mac OS X and experience a kernel panic forcing you to restart your Mac? If you viewed the Mac OS crash report, it may look similar to the below example report. It does not matter what you were browsing in Google Chrome when the kernel panic occurs. While it isn’t exactly known why Google Chrome is causing the kernel panics, online discussions suggest incompatible Mac OS 3rd party driver software conflicting with Google Chrome being the most common cause. If 3rd party drivers are the cause, your Mac OS crash report will display this information in the immediately above the line about BSD process name corresponding to current thread:Google Chrome. If your crash report contains lines about drivers, check for the latest updates for that particular driver on the vendor’s website. All else, follow the steps below. 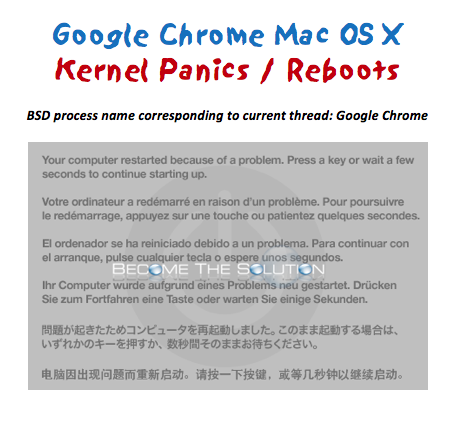 Below are suggested solutions to prevent your Mac to continue Kernel Panic while browsing with Google Chrome. Reset Google Chrome to defaults and clear all caches. Go to Chrome menu -> Clear Browsing Data -> Advanced -> select all options and all time time range and click clear data. Update Google Chrome. Go to Chrome menu -> About Google Chrome. It will automatically check for the latest software update. If you have another solution or have been experiencing this issue, please let us know using the comment form below. Example of sample output crash report error from a Google Chrome kernel panic in Mac OS X.